Whether you want to be the belle of the ball or let the little ones have fun dressing up as their favourite characters and superheros, Simply Fancy Dress have something to meet every taste and budget. The Gruffalo is a well loved story in our home and we were thrilled to received the costume to match - Jamster rushed to put it on straight away and got in to the role! Made from Polyester it's comfortable to wear and easy to clean, you can just pop it in the washing machine with the rest of your laundry. We received age 3-5 and this fit Jamster (aged 6) just right so there is plenty of room for growth and years of fun to be had. You can pass it onto siblings too as it's a tale that can be enjoyed by the whole family.
" He has terrible tusks, and terrible claws, And terrible teeth in his terrible jaws." "He has knobbly knees and turned-out toes, And a poisonous wart at the end of his nose"
"His eyes are orange, his tongue is black; He has purple prickles all over his back"
There is a Velcro opening at the front so children will be able to dress themselves with ease and elasticated straps to the feet and hands for a better fit. Jamster had no issues getting in and out unaided. The costume is very durable and as well as fun at home it would be great to celebrate World Book Day in March! - There is free delivery included too. Simply Fancy Dress have kindly provided a costume in age 3-5 years worth £23.99 to giveaway! You can enter via the Rafflecopter entry form below before 20th December 2012. My daughter loves penguins so the Child Comical Penguin Costume (ref: 62904) gets my vote! A cracking costume, certain to make somebody's Christmas extra special. i like the toddler bumble bee costume! The Hungry Caterpillar - a classic! I love the KIDS Captain Hook one!! SO cute! 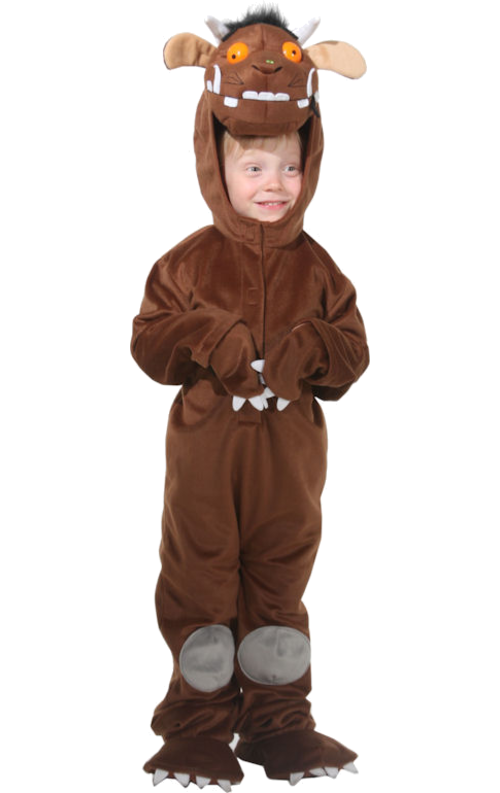 My grandson would love the Gruffalo costume. elite flapper costume! i follow via email as talcfour. Love the captain hook costume! Love the childs little bo peep one.. 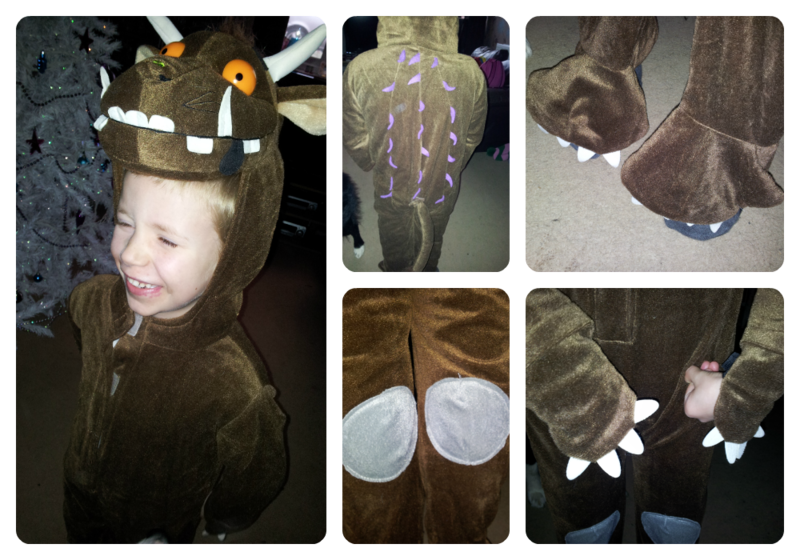 I prefer the gruffulo though, my daughter is gruffalo mad lol. The hungry caterpillar is fun! My fav is the gruffalo, all of my kids love that story so I would have to go with it! Gruffalo one is the best! I love the child Dragon costume. Very cute. Got to be Where's wally! A classic! Child Moshi Monsters Zommer Costume (ref: 73905) for my son, who is mad on Moshi Monsters! The dragon costume my son loves dragons! Love the Where's wally costume! I love the hungry catterpillar costume, so cute! Wow! He looks great in that fancy dress. So cute..
My daughter would love the peppa pig costume! The toddler bumblebee costume, my daughter would look so cute in it!! the angel costume with wings, it looks really lovely. I love the Hello Kitty Ladybird costume, so cute! I love the bee costume! I really like the Where's Wally costume! Nice choice of fancy dress ideas for Christmas. he looks cute in it.